The San Francisco 49ers need pass-rushing help this offseason. 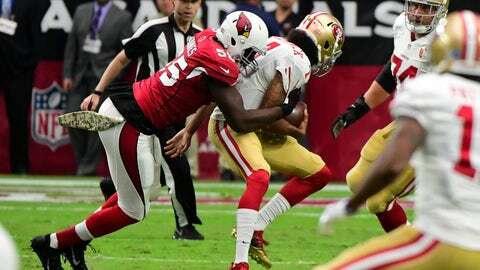 One way to do that, and weaken an NFC West rival, would be to sign Arizona Cardinals edge rusher Chandler Jones in free agency. The San Francisco 49ers were tied for 19th in sacks last year with just 33 total. And unless the team is banking on outside linebacker Aaron Lynch having a bounce-back season in 2017, it’s pretty clear the Niners defense needs help here. One target coming to mind on the free-agent market is Arizona Cardinals edge rusher Chandler Jones. Jones, of course, found his way to Arizona prior to the 2016 season via a trade with the New England Patriots. He switched from a defensive end in the Patriots’ 4-3 base scheme into an outside linebacker/EDGE in the Cardinals’ 3-4 defensive front. And Jones relished the switch, posting 11 sacks and 38 tackles on the year. His 87.4 overall grade, according to Pro Football Focus, was tied for seventh overall among qualifying edge defenders in 2016. Needless to say, the lackluster 49ers defense could benefit from Jones’ production. As noted, San Francisco’s sack production is clearly lacking. The Niners best exterior pass-rusher, Lynch, amassed a mere 1.5 sacks in 2016. And it isn’t as if the 49ers should bank on guys like Eli Harold and/or Ahmad Brooks being major factors either. More on Brooks in a moment, but Jones would be a clear upgrade over any of the aforementioned names. Jones, an every-down linebacker, would take over Harold’s role in base defenses. In nickel formations, Jones would likely bump Lynch over to the left side of San Francisco’s front seven. This would put Jones alongside defensive end DeForest Buckner, who is quickly emerging as one of the NFL’s better pocket-wrecking forces. Joe Staley and Colin Kaepernick introduced to Chandler Jones, who should be among #49ers top targets if he's allowed to hit free agency. Jones will get paid this offseason. That much is known. San Francisco should have zero problems making this work though. Armed with roughly $81 million in cap space, the 49ers could clear even more room by cutting Brooks this offseason. Brooks is scheduled to make $4.45 million in base salary in 2017, but the Niners would save a total of $5.3 million if the 32-year-old veteran — in the declining stages of his career — is released. So if we assume Jones will get his $15-plus million in 2017, nearly half of that could be accounted for simply by parting ways with Brooks. This would turn the deal into a mere $10 million signing for the upcoming season. Jones won’t come cheaply though, and it’s likely he’ll be a No. 1 target for a number of teams. And there remains a real possibility the Cardinals use the franchise tag on Jones which, according to CBS Sports’ Joel Corry, would be nearly $15 million. And Arizona has about $33 million in cap space, so one can only speculate how this pans out. Still, if the Niners can pull this off, they’ll boost a weak defense and add another dynamic player to the front-seven unit. And San Francisco will significantly weaken their NFC West rivals. Make the move, 49ers. You’ll be happy you did.